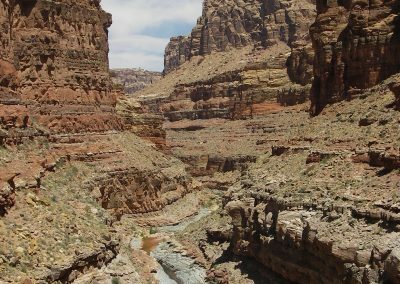 Dark Canyon Sundance Trail | Why you should have a pre-trip inspection? 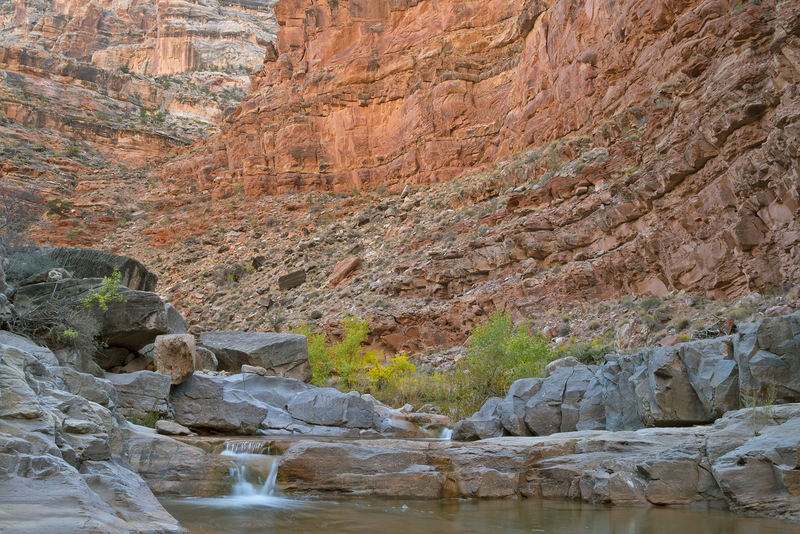 It was early May, and already the heat in the Dark Canyon Gorge was approaching a hundred. 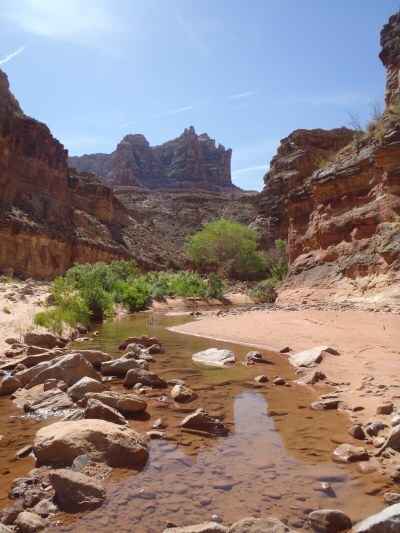 We had spent the weekend camping on a rocky outcropping that overlooked the Colorado River. 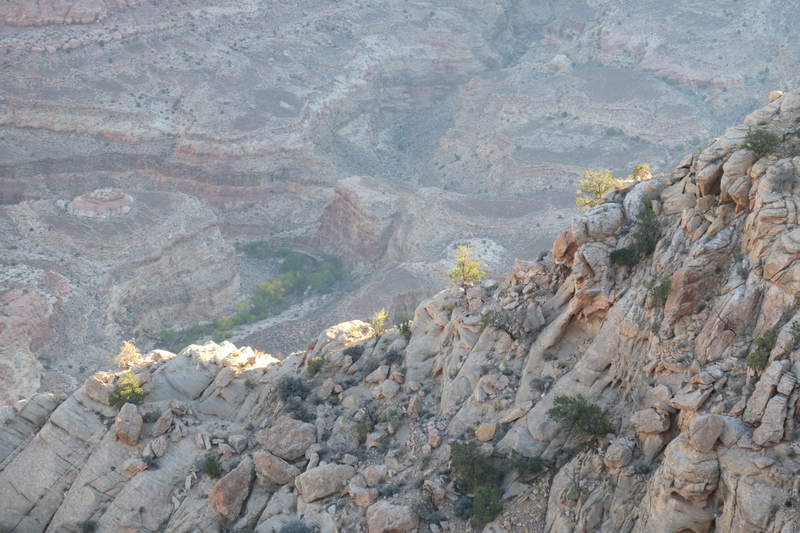 As I trudged, one foot in front of the other, up the steep talus slope that would raise us 1500 feet above the canyon floor, I pondered the bad decisions that put an extra 20 pounds in my pack. Now I was halfway through the most dreaded part of the journey a thought occurred to me: “There has got to be a better way to regulate what people bring.” A thought I should have had several days prior. Throughout several years, I have had the privilege of adventuring with hundreds of people. Occasionally, someone will contact me and say, “I had so much fun! My sister’s friend’s cousin’s dog walker saw the pictures on Facebook. She and her friends think it would be fun and want to know if you will take them.” Now when you are passionate about something, you want to share it with people, and sometimes that passion overrides better judgment. In my case, it almost always overrides better judgment. Usually, when this happens, it provides for an interesting trip. I am not saying a bad trip, just that it takes some time before “interesting” becomes a positive phrase. As I repeated the mantra “One foot in front of the other, don’t fall down.” to myself, I wondered just how much time would have to pass. This particular adventure started normal enough. It was a group of first timers who had experienced camping but had never been backpacking before. It was an old friend of mine, her husband and a couple of her friends. I knew them from the night-club years when we would dress up like adult versions of rainbow bright and stay up until wee hours of the morning. I never pegged them for the adventurous type; they were more likely to be found shopping in Wet Seal than Out n Back. However, after ten years of not seeing or talking to her, I ran into her and her husband hiking in Zion. I figured they turned over a new leaf and assumed they had friends who were outdoorsy also. When she suggested I take her and some of her friends on an adventure, I thought “Sure why not” Enthusiasm tramples judgment. The trip in was what you would expect with some first timers. Some people are complaining about blisters and a couple complaining about the weight of their pack. All the complaints went away when we reached the bottom. After a long descent of more than 1000 feet, down a steep talus slope, the 3 mile trak comes to an end in a picturesque streambed lined with trees and numerous spots for primitive camping. Everyone set up tents, grabbed some grub, and played in the waterfalls, stream, and river. Even the next day was normal. We talked, got to know each other, and explored the surrounding area. 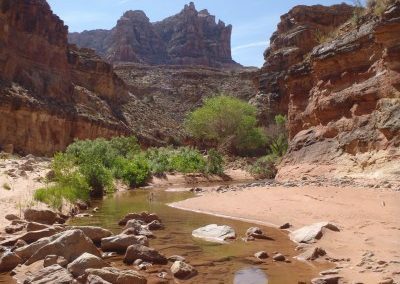 There is a lot of great exploring in the area, up the river to Lean To Canyon or down the river as far as Cataract Canyon and the Colorado River. 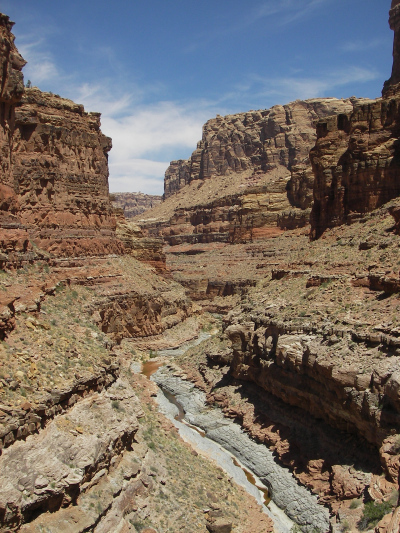 The trip to Cataract canyon involves lots of waterfalls, pools and unusual layers of limestone. Many of the pools are deep enough to jump in, which is exactly what we did for the remainder of the weekend, until Sunday. It was Sunday, the hike out when things got strange, and my pack got heavy. On the way up, one girl was lagging and complaining about pack weight. My friend who was bringing up the rear called me and informed me the pack was indeed, really heavy, unusually heavy. I was skeptical and stopped everyone to give them a rest. Dropping my pack, I headed to the back so I could assess the situation. With a heave, I lifted the pack, and it was unbelievably heavy for a 5’2 100 pound glam girl. The pack was twice what mine was at 20 pounds. My inquiries into what she had in her pack were answered with a flushed face that matched her bright red shade of lipstick. It was at this point I realized she looked unusually voguish the past few days. Perfectly applied lipstick, eyeliner, and mascara were not something you would expect for someone backpacking in the remote wilderness. After setting the pack on the ground, I mentioned that we would have to do something to redistribute the weight among the other backpackers. Once again, I was confronted with only a flushed face. Nothing could prepare me for what I would find when I opened the backpack. As soon as I finished peeling back the cover, I was greeted by two tiny silver prongs the kind you would plug into a power outlet in your house. 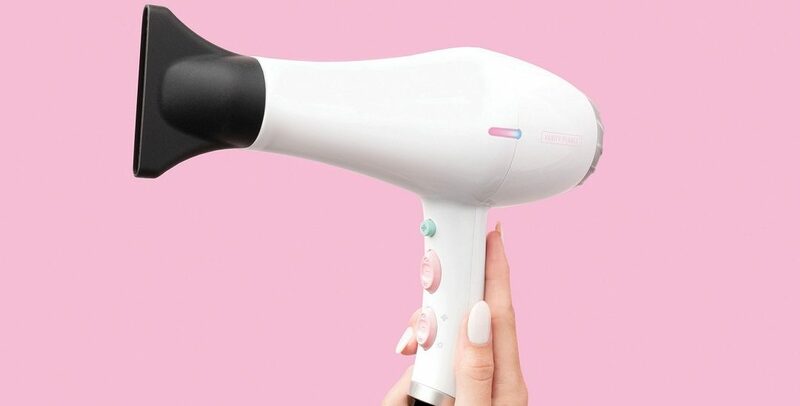 Following the cord, I came to a hair dryer that was neatly cuddled with its pal the curling iron. Underneath the exotic hair maintenance accessories was a full service make up kit. Below that a small stereo with an equally useless two silver prong attachment attached to it. I remember sending out a list of what to bring but never sending out a list of what not to bring. I am pretty sure that if I did send out the list of what not to bring, these things wouldn’t have been on it anyway. And now, here I was with my pack significantly heavier, reciting the only mantra that would get me to the top, wondering how long it would be before I would look back at this and laugh. I did figure out how to remedy this problem. When I am going out with people for the first time, I have them bring their already- packed backpacks to my house the night before. We do a pre-trip gear check to make sure everyone has what they need, or really to make sure they don’t bring stuff they don’t need. It has worked out well since then. My enthusiasm and judgment are getting along just fine.